Can you make a promise and keep it...? Promises, promises, promises... From early life, our parents make promises that we all hold them to. As children we make pinky promises, then as adults we are held to account for promises we make to our partners. Like it or not, each promise is a 'social contract' and we need to think twice before making and breaking them. 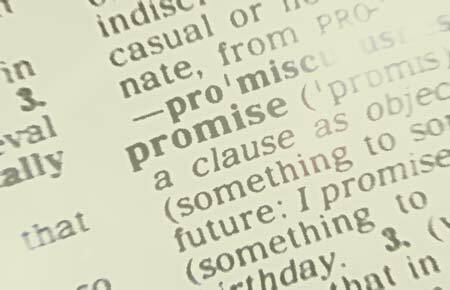 Research conducted at the University of Chicago Booth School of Business shows that people expect promises to be kept however it also suggests that keeping a promise is worth more than exceeding it...Questioning the old business adage of under promise and over deliver. The leading University of Chicago researcher, Nicholas Epley says there are two implications to keep in mind, both in our professional and personal lives. The first is that maintaining good relations with other people does not require a massive effort. Do what you promise you’ll do and people will be grateful. The second is that you don’t need to be Superman and go above and beyond your promises in order to be appreciated by other people. Another point that Professor Epley makes is, "if you put in the superhuman effort to do more than you promised, don’t get angry when other people don’t seem to appreciate the extra work you put in. They’re not inherently ungrateful or unappreciative, they’re only human." The researchers conducted their trials with undergraduates of the University by having them imagine purchasing tickets to a concert from an online ticketing company for Row 10 in the theatre. 3. Others got the exact tickets that they were promised. The participants who received the tickets they expected were happy. The researchers found however that participants did not have a more positive reaction to receiving better tickets than promised, infact they were likely to be negative. While those who received the worse tickets viewed this much more negatively than either of the other two scenarios. The results of these experiments suggest that it is wise to invest effort in keeping a promise because breaking it can be costly. Keeping a promise is after-all related to trust and reliability. Interestingly though, it may be unwise to invest additional effort to exceed one's promises. When family and friends go to the effort to keep a promise, their effort is likely to be rewarded. But when they go to extra effort in order to exceed those promises, their effort appears likely to be overlooked. Their final comment was "Promises can be hard to keep, and promise makers should spend their effort keeping them wisely."